Learn about the Cavalier King Charles Spaniel’s history, diet and health to discover what makes this breed unique. The Cavalier King Charles’ history makes for an interesting read! The Cavalier King Charles Spaniel and the King Charles Spaniel were considered the same breed until the early 1900’s, when a division within the breed was recognised. Some preferred the “new type”; smaller and with rounded skulls and shorter muzzles, while others preferring the “old type”; slightly larger and longer-muzzled dogs. This “old type” was then given the name Cavalier. It is said that the Spaniel of Mary Queen of Scots was found hiding in her petticoats after she was beheaded. Toy spaniels can be traced as far back as the 16th century and were bred from the sporting breed, becoming popular with noble ladies as playthings and comforters. A miniature Spaniel by all accounts, the Cavalier should still retain the same balance, activity and grace of the larger versions of the breed. This breed has a moderate muzzle and large dark eyes, which some people say look filled with emotion. The long silky coat is a classic trait of the Cavalier, with feathering on the legs, tail, and undercarriage. The coat has four recognised colours: ruby, black and tan, blenheim (chestnut markings on a white background) and tricolour (black and white with tan markings on the eye brows, cheeks, underside of tail, inside ears and legs). 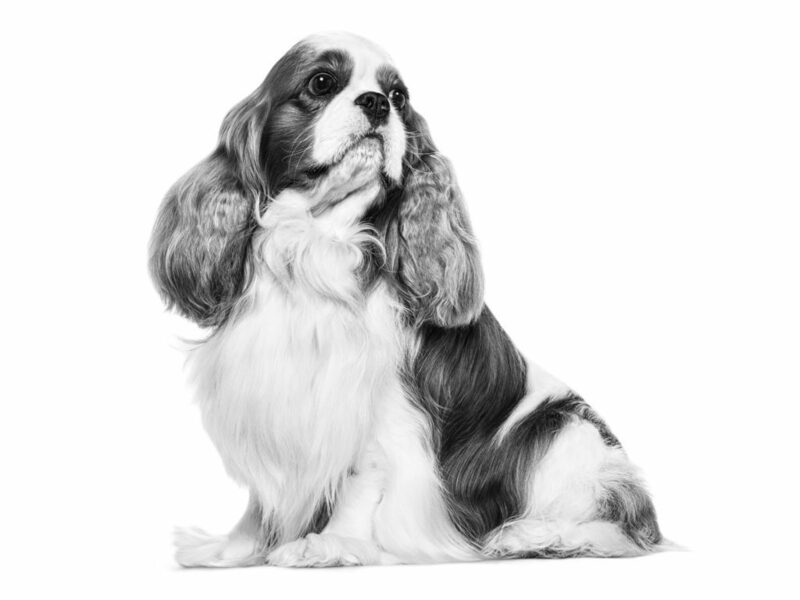 When it comes to Cavalier King Charles grooming, your dog will only need to be brushed and cleaned once a month to help maintain healthy skin and a good coat condition – as well as reduce Cavalier King Charles shedding whereever possible. In relation to the grooming needs of other breeds, this breed is relatively low maintenance. Gentle, affectionate and charming, the Cavalier King Charles is friendly and fun to be around – the active and sporting side to their nature can be encouraged further by owners. The Cavalier King Charles Spaniel is a puppy until 10 months of age and, during this time, will be growing rapidly. The skeleton, digestive system and natural defences will all be developing and can benefit from adapted nutritional support. It is also important to provide a diet which contains the nutrients required to help support good cardiac function; EPA/DHA, antioxidants, taurine, and L-Carnitine. Ideal Cavalier King Charles food for puppies: ROYAL CANIN® Cavalier King Charles Puppy. When it comes to your Cavalier King Charles’ health, there are some sensitivities and nutritional requirements to bear in mind. The Cavalier King Charles adult is a small dog whose gentle and laid back nature can mean that they are at risk of weight gain. Therefore, a diet with a moderate calorie content should be considered, and care should be taken over feeding quantities too. Other considerations for this breed include support for their silky coat, as well as a diet which can offer nutritional support for good cardiac function. Ideal nutrients include EPA/DHA, an adapted mineral content and a good supply of taurine, L-Carnitine and antioxidants. Ideal adult Cavalier King Charles dog food: ROYAL CANIN® Cavalier King Charles Adult.